SCHUNK, the competence leader for gripping systems and clamping technology has expanded its product range with a sealed 6-jaw pendulum compensation chuck for clamping deformation-sensitive workpieces. The special seals located on the serrated jaw interface and pistons of the SCHUNK ROTA NCR-A prevent grease from being flushed out and prevent the clamping force from being gradually lost. Precise chuck function is ensured, even at low clamping forces. In addition, the seal prevents chips or dirt from ingress into the chuck body. This increases process reliability and lengthens maintenance intervals, translating into less frequent lubrication and cleaning of the lathe chuck. The SCHUNK ROTA NCR-A consists of a central chuck piston carrying three inner pendulums aligned at 120°. Each pendulum is connected to two base jaws. This ensures workpiece centering between six contact points, which can be adjusted in pairs. As the clamping forces are directed towards the chuck center, optimal centering is achieved without distortion of the workpiece. The chuck perfectly adjusts to the workpiece with its oscillating jaws. 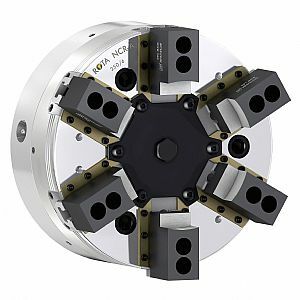 With conventional jaw clamping, this configuration allows for maximum concentricity of the workpieces and ensures optimal centering at the same time. In the case of ring-shaped workpieces, deformation is reduced by a factor of 10 as compared to clamping with 3-jaw chucks. Users can also clamp the pendulum of the ROTA NCR-A in the center position during the final processing stage or when clamping pre-turned surfaces so that all six jaws move concentrically. The clamping force between the first and second clamping can be adjusted by means of a pressure reduction at the hydraulic cylinder. An extremely rigid chuck body and long jaw guidance ensure high repeat accuracy and precise results.